The Technal team wishes you a merry Christmas and a very happy and prosperous new year 2012! The Technal team was very glad to welcome you at its villa-like stand featuring an interior tree-filled patio. Major innovations for sustainable building. 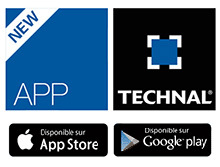 Once again, this year, Technal will be at the Batimat fair, from November 7 to 12, with a stand that will be sure to impact everyone. Technal, a brand owned by the multinational Hydro Building Systems, has joined the Corporate Members programme of the The Guggenheim Museum Bilbao Foundation (Fundación del Museo Guggenheim Bilbao) in the Associated Companies category. Technal participated in the prestigious Hotelier India Awards 2010 ceremony by sponsoring the "Chief Engineer of the Year" category held at Westin, Gurgaon on 16th December 2010.